The cast and crew of TARTUFFE, offer an insight into behind the scenes. For someone unfamiliar with Molière and his work, how would you describe what happens in Tartuffe? Saskia: It’s a play about a Conservative minister and his household, into which a charlatan arrives. The family represent the establishment – they’re a happy family but part of the political establishment and we observe absurd behaviour and the repercussions it has for everyone else when this conman, Tartuffe, deceives the head of the household. Mark: I think the play deals with people’s fascination with conmen and imposters. Their behaviour may be reprehensible, wrong and illegal, but it’s also fascinating. The play examines why people become conmen – not just for the end result but also the adrenaline of getting away with it and moving onto the next outlandish scheme. That’s certainly the case with Tartuffe. He can’t get off this treadmill and when he’s nearly found out, he has to constantly re-think his next move. Saskia: It’s a comedy – there’s something funny about the characters in the play, and the audience too, suspending their disbelief and going along with these preposterous situations. Tartuffe is apparently the most performed play in the history of French classical theatre. Why do you suppose this is? And what should audiences expect from this particular, modern production? Mark: I think it was popular in France because there’s a certain iconoclasm in debunking and satirising the church. Ours is different but there are modern day, quasi-religions satirised here. It must have had relevance throughout its history in terms of the targets it satirises. Also there are universal themes of gullibility and suggestibility that speak to people and that people can recognise. 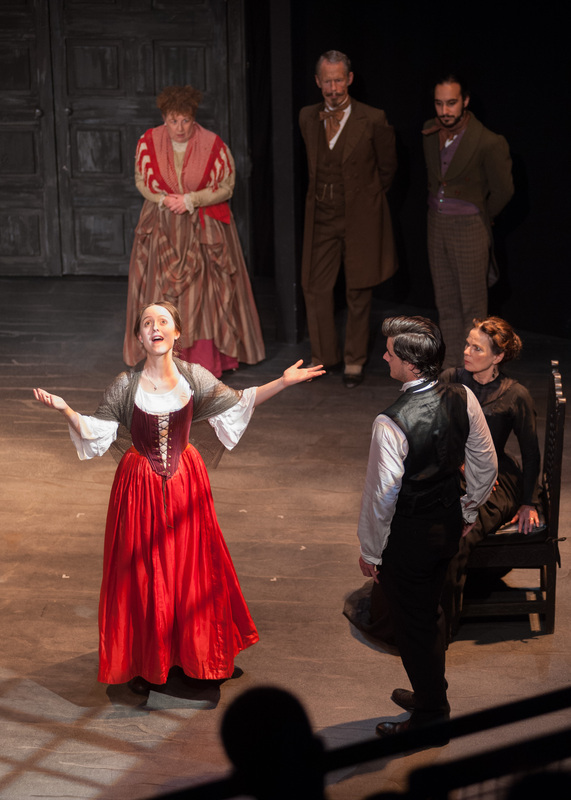 Saskia: This new adaptation is faithful to the original plot structure and its rhyming couplets still evoke that sense of classical, heightened drama and comedy, but the vocabulary and references are contemporary. So the rules of classical theatre, together with heightened themes and comments on society are observed, whilst being grounded in the everyday. Dominic and Andrew’s version of the play is set in present day London. What about the play do you think lends itself to this setting? Saskia: The play is set in a particular part of north London – Hampstead – and this is relevant. It speaks to people today, highlighting a suspicion of the ruling classes/whoever holds the power. With the media, we’re bombarded by people wanting to get something from us, trying to get us into their way of thinking and we don’t always don’t know what their motivations are. What makes Tartuffe fun is that this behaviour is transferred into a person who enters a family house. It’s a fun and effective way of looking at what’s going on in society. Mark: Yes, hopefully people will recognise the allusions and references and see that what they observe going on are things that aren’t far removed from their own lives. The household is like a microcosm of society. Saskia: It is clear from what Tartuffe says that the head of the household was at a crisis point in his career, needing something to hold onto. He was ripe for someone like Tartuffe to take advantage of that. There’s the implication that this is a personal mid-life crisis for him but also the sense of that type of crisis going on in society at the moment. Mark, what would you say is the key to understanding Tartuffe? Does he have any redeeming features? Mark: The short answer is no! Unless you count his ability to spin situations and perhaps there’s something admirable in that. Hopefully audiences will warm to that but as a character, I don’t think he has any redeeming features. I suppose you might have a scrap of sympathy for him at the end, seeing that he’s essentially running from one adrenaline fix to another, and that’s no real existence. Saskia: There’s a similarity with Iago in Othello, but with Iago you get more insight from the play into why he’s the way he is; Shakespeare invites people to tease that out about him. But you don’t get that with Tartuffe, that’s not part of the ambition of the play – and that’s refreshing! It makes it fun and bewildering to rehearse! Mark: I’d say that Tartuffe is a sociopath, but that doesn’t matter so much. What’s more interesting is how he affects the other characters in the play, who have more layered humanity. How he makes them all behave. What have you most enjoyed about rehearsals and what have been the challenges? Saskia: It’s been really enjoyable feeling it coming alive. We’ve been letting go of any ideas we brought with us in order to respond to the people around us and the world we’re creating. It’s a nice feeling when that gels. The challenges are technical ones. The verse that the play is written in needs to be respected but the language is every day. It’s a challenge to make that gel and keep it fluid and light with modern delivery. Mark: The action takes place with one sweep of an arc, across a day and we don’t get off this moving train so it’s fast paced. This will keep up the energy and the rhythm and take everyone along, making it quite entertaining…hopefully! 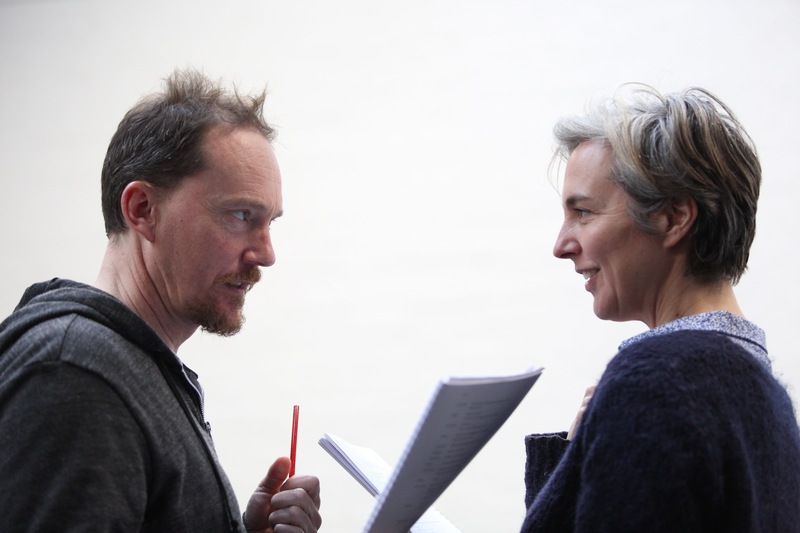 Catch Saskia and Mark in our co-production of Tartuffe with Tobacco Factory Theatres from Thu 06 April – Sat 06 May.